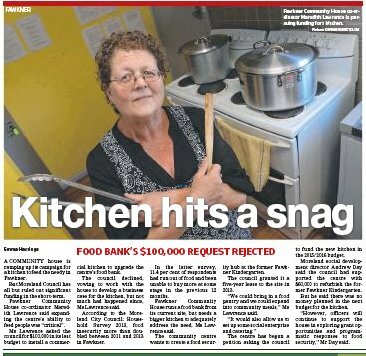 Moreland Leader reported on our need for new kitchen facilities to more adequately provide our Food Bank service in Fawkner to meet the needs of our community. A COMMUNITY house is ramping up its campaign for a kitchen to feed the needy in Fawkner. But Moreland Council has all but ruled out significant funding in the short-term. Fawkner Community House co-ordinator Meredith Lawrence said expanding the centre’s ability to feed people was “critical”. Ms Lawrence asked the council for $100,000 in its last budget to install a commercial kitchen to upgrade the centre’s food bank. The council declined, vowing to work with the house to develop a business case for the kitchen, but not much had happened since, Ms Lawrence said. According to the Moreland City Council: Household Survey 2013, food insecurity more than doubled between 2011 and 2013 in Fawkner. In the latter survey, 11.4 per cent of respondents had run out of food and been unable to buy more at some stage in the previous 12 months. Fawkner Community House runs a food bank from its current site, but needs a bigger kitchen to adequately address the need, Ms Lawrence said. The community centre wants to create a food security hub at the former Fawkner Kindergarten. The council granted it a five-year lease to the site in 2013. “We could bring in a food pantry and we could expand into community meals,” Ms Lawrence said. The centre has begun a petition asking the council to fund the new kitchen in the 2015/2016 budget. Moreland Council social development director Andrew Day said the council had supported the centre with $60,000 to refurbish the former Fawkner Kindergarten. But he said there was no money planned in the next budget for the kitchen. “However, officers will continue to support the house in exploring grant opportunities and programmatic responses to food security,” Mr Day said. If anyone is interested in helping to collect signatures for the petition please come and collect some forms from the office.